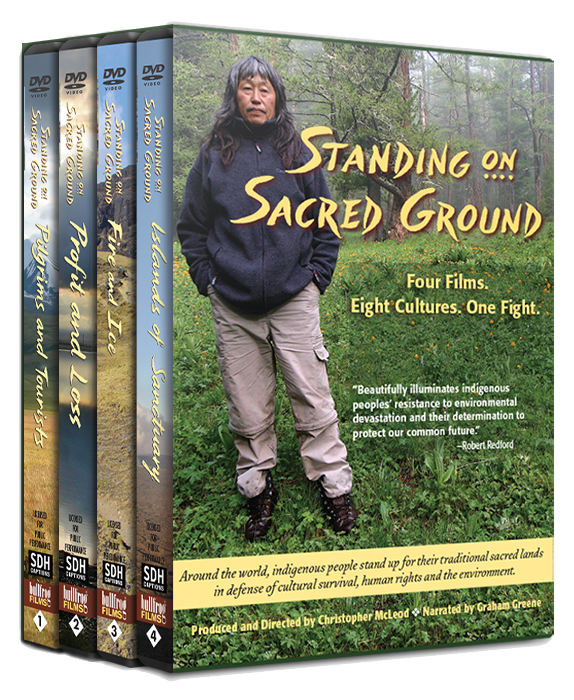 The Standing on Sacred Ground DVDs are intended for use in high school and college classrooms. We have produced a detailed Teacher’s Guide to assist in filling in background and leading discussion. It is available for free download here. Universities, high schools and libraries can order DVDs from our educational distributor Bullfrog Films. The film series can also be used in communities to raise awareness and help raise funds for nonprofit organizations. The DVDs are also available for home screenings of 8–10 friends who wish to grapple with the issues raised in the films. Our free downloadable Discussion Guides will help facilitate a thought-provoking conversation. For individual and community use, please click here to order.